Ho, ho, ho – twas only four weeks before Xmas and you still haven’t planned your company holiday party – what to do, what to do? 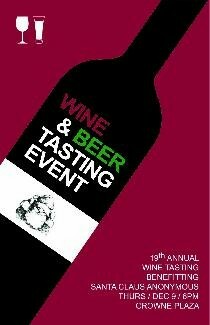 A great solution is the 19th Annual Beer and Wine Tasting put on by and benefiting Santa Claus Anonymous. We’ve all heard of Santa Claus Anonymous, whose main goal is make sure underprivileged children receive toys.